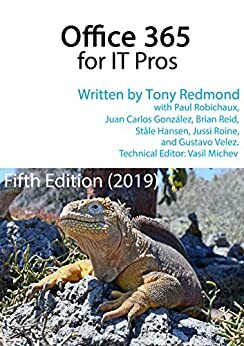 The author team is delighted to announce that the eighth update for the Office 365 for IT Pros eBook (2019 edition) is now available for PDF/EPUB and Kindle. Subscribers can download the updated files using their Gumroad (PDF/EPUB) or Amazon (Kindle – should be online by 12 noon EST) accounts. See the FAQ for more information about how to download the updated files. We encourage subscribers to download and use the updated files. It’s a source of some bemusement to us that only 37.6% of our Gumroad subscribers downloaded the seventh update. There’s no point in reading outdated information, especially if you’re paying to receive updates. 16 Nov 1 Included new Office 365 numbers from Microsoft Q1 FY19 results. Microsoft is developing migration tools to move G Suite data to Office 365. 16 Nov 2 SLA performance for Q3 CY18 added. 16 Nov 4 Accounts assigned Teams Service Administrator role can now create new Office 365 Groups when group creation is restricted. Updated section on using PowerShell to manage Azure AD. 16 Nov 5 Added section about protocol authentication policies. 16 Nov 7 Removed section about searching for mailbox events. Now in 21. 16 Nov 8 Multiple changes throughout chapter. 16 Nov 12 Azure B2B Collaboration policy is now managed in Organizational Relationships section of Azure AD portal. 16 Nov 13 Added note about Teams spell check dictionaries. Added note that Teams ignores the Azure B2B Collaboration policy deny list if guest users already exist in AAD. Windows S client is deprecated and due for retirement on November 29, 2018. Dynamic Teams are now formally supported. Teams mobile clients now expose organizational information for the home tenant. Many other small changes throughout chapter. 16 Nov 16 Remove reference to Teams Windows S client. General review of the text and many changes made to reflect the current state of the Skype for Business Online to Teams transition. 16 Nov 19 Rewrote section about removing retention labels. Added detail about audit records logged for automatic label application. 16 Nov 21 Inserted example of searching Office 365 audit log for email events. 16 Nov 22 Added details about DLP rules and confidence levels. 16 Nov 23 General update. 16 Nov 24 MAJOR UPDATE: The information about working with rights management templates and Azure Information Protection labels that used to be in this chapter is moved to the companion volume and replaced with information about Office 365 sensitivity labels. First – love the book. I’ve been a supporter from the first edition years back. I use the book as a reference more than a read and I suspect most people do. I typically update the book only when I’m looking into an issue or researching a new feature (like today) Now if you’re looking for more “Update just because a new version is out” clicks, try adding URL links on the notice .. simply adding “https://gumroad.com/library” on the “goto your Gum Road account” will increase the base hit count because it’s easy and we are lazy unless we NEED something from the new book. At the top of page 105, you stated “The topic of dealing with Office 365 Groups in hybrid environments is covered in the companion volume.”. Where can we find this companion volume? The companion volume is available in two files (PDF and EPUB) that subscribers can download from their Gumroad account. Kindle buyers have to buy the companion volume separately (for $9,99) because Amazon doesn’t allow us to create multi-volume books.